On November 30, 1939 the Soviet Union attempted to annex Finland. "War between Finland and Russia, David and Golliath, good and evil, democracy and totalitarianism, freedom and slavery." Soviet Army with an unlimited supply of skiis. Finnish people have always been relatively free and independent, even when they were part of Sweden for seven hundred years and one hundred years as a Grand Duchy of Russia. Finland achieved full independence in 1917 and became more prosperous and happy than Russia, the enemy to the east. Perhaps it was time to teach these Finnish capitalists a lesson. Always the opportunist by nature, Russia has expanded its territory and influence by conquest. The people of Finland had no desire to become a vassal of Stalin under any circumstances, nor did they particularly trust Russians in general. They were united in their desire to remain free. Stalin tried in vain to con the Finns into letting him take over the country without resistance. After all, it is sound policy not to risk a war and possible losses, when it might be possible to just walk in and take over. The main excuse for his takeover of Finland was the need to protect Leningrad, as the border was just 30 km from the city. Otto Ville Kuusinen, the Finnish communist traitor who escaped across the border in 1918, thought this one up. It was a perfect excuse, after all, who can blame anyone for trying to protect themselves. Stalin liked the idea and wanted to make Otto the leader of a communist Finland after annexation. But something went dreadfully wrong with this plan. 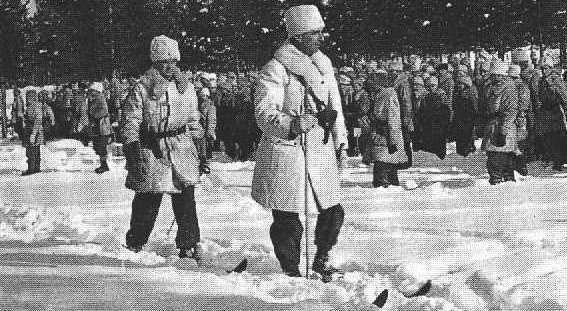 The Soviet leadership thought they could take Finland in two weeks so they didn't even bother with the white suits or a lot of warm clothing. In desperation they took away coats because soldiers were laying down in the snow to avoid being killed. Soviet arrogance and stupidity was displayed for the world to see. This is the story of what happened when Stalin tried to swallow this stubborn chunk. The story has two chapters: The Winter War (1939-40) and Continuation War (1941-44). Stalin found out that the Finns are a tough northern people who know how Russians operate. This story begins in the forests of Eastern Finland's Karelia province, between the shores of the Gulf of Finland and the Arctic Ocean. It is about the historical epic life and death struggle of a tiny country against the powerful "Evil Empire." The war against the Finnish people began when the Finnish people refused to do as they were told by their giant neighbor. They dared to say "no" to Russia's illegal territorial demands. The Soviet response was the invasion of Finland on November 30, 1939. The writer, whose father had just joined the Finnish army in the summer of 1939, believes that most people are tired of the propaganda films and history books that leave out "uncle Joseph's" part in starting the war and murdering millions of innocent people, and simply magnify Stalin's defeat of Hitler. Aren't you being a little harsh on good old Stalin, our ally? You may ask. Absolutely not, he was a cunning mass murderer, as all mass murderers are. But lies have been taught to two generations now and this page is an attempt to set the record straight. American propaganda prepared the American people to position Stalin in a favorable light, while the British were told that Stalin was good now. Yes, American media was very pro Stalin. Had they not heard that he had killed? Not just one or two people either. So why pump up this mad-man? The truth about this evil man, Time Magazine's two-time Man of the Year, Stalin is now being told. There is no denying that he took on Hitler's army and defeated it. But do these actions cover the 40 million people, whose deaths he was responsible for? Here is an ethical question which is answered in different ways by different writers, depending on what they are focusing on. He was just as good at killing his own people as Germans. His actions against innocent people, and those of his allies, will not be forgotten. The League of Nations expelled the Soviet Union after branding her an aggressor in violation of treaties with Finland, the League Covenant, and the Pact of Paris. Never before had such actions been taken against a League member. The League agreed to coordinate international aid programs for the Finns. Unfortunately for the Finns the League ended from lack of support by Britain and France. As a result, Finland lost one-tenth of their country including 3 cities, representing one-twelfth of the farm land of Finland, one-tenth of the industry. Receiving great admiration abroad, the Finnish people became an example to all small nations of the world that are harassed by larger countries bent on justifying their ends by force. From the author's point of view, and a point of historical fact, the war was Russia's fault. Yet Finland was made to pay dearly. Finland's struggle to remain free consisted of two phases, the first being the Winter War of (1939-40), a failed attempt to annex Finland in two weeks which resulted in the loss of Karelia province. The Continuation War (1941-44) broke out when Hitler invaded Russia and Finland took back its lost territory and held it until gradually losing it after D-day. The Finnish army began its slow retreat from Lake Onega in Eastern (Russian side) Karelia, the area Finland claims on ethnic grounds, which Russia does not recognize. To Russian leaders the eastern Karelian people are a separate ethnic group; to Finnish people they are Finns which belong to a "Greater Finland." Between 1941 and 1944, education was switched from Russian to Karelian, which would have saved the culture from extinction. In the end with overwhelming force of artillery spaced every 300 feet, and facing eventual defeat, Finland signed a peace agreement. No attempt was made by the Allies to intervene and save our homes in western (Finnish) Karelia. Instead, Finland received warnings to stop resisting Stalin. To get Finland to cease fire, Russia employed the greatest concentration of artillery in the history of warfare. The result was Finland remained free but lost Karelia, its most beloved province, and the destruction or dispersement of its geneological structure. Antti and Meeri, the writer's parents, were among those who had to leave their homes behind. This was agreed to by the Allies, an act that shall live in infamy forever. Despite being extatic about their victory over Hitler, civilians of America and Britain condemned these and other unwise, genocidal, actions in Europe by their leaders. The harsh terms of peace in 1944 was the fault of the Allies and the victim of aggression was Finland. In the end Stalin got most of the countries he had planned to get with Hitler. Britain and United States had made an ally out of the USSR and reversed their position on Finland. Now Stalin was carving up Europe with his new allies instead of Hitler. This was a betrayal to all nations that Stalin wanted to occupy including Poland, the country Britain promised to help, costing 6 million lives. Stalin had tried but failed to turn Finland into a puppet state in 1918. His real goal in attacking Finland was to complete the failed task. In August 1939 Stalin had a record made for the Finnish people about how he was coming to save them from the capitalists. Suomi Beauty. Stalin wanted was a buffer zone against the Nazis. This was the official reason for attacking Finland, one that history books state without question. Not a bad excuse to annex a neighbor, and some may argue for Stalin's "position." But this was, as you can see by the evidence of Stalin's true motive, just an excuse used by him in 1939 and the Allies in 1944 to perpetrate this crime on the Finnish people. History is written by the winners. The Soviets won the war against Finland, but only with a lot of assistance from America. It doesn't surprise me that Americans will sometimes view these truths with some questions. Like for example, if what you say is true, why don't we read about it in our history books? Good question. As I mentioned, the victors write the history, and only by reading these types of pages written by second generation children, will the truth be told. In this page you will not find sympathy for such actions, nor for the unconscionable acts done in their kangaroo court against the people of Finland and Eastern Europe by three men. The idea that somehow Finland was guilty in some way in its military actions against the overpowering strength of the Soviets and their aims regarding annexing Finland, and therefore Finland deserved the loss of Karelia and the harsh terms, is absurd. Since Churchill, Roosevelt and Stalin said so it must be true: Finland is an aggressor nation and must be punished. The truth is that the allies wanted to please Stalin, and what Stalin wanted Stalin got which is pretty plain to anyone who wants to see. The gifts he got in the Baltic area were: Karelia, Estonia, Latvia, Lithuania and Poland. Whether you believe that Russia had some legitimate claim to Karelia or not, one thing is clear: Russian goals in that region were towards dominating the Baltic by annexation of those countries. The ends achieved by aggression, namely annexation of Karelia by breaking treaties must be reversed and the displaced Karelian people must be returned back to their homes. Time does not diminish the need for justice. Criminals must not profit from their crimes, and the keepers of justice in the world should correct their mistakes where genocide and territorial annexation are concerned. Finland is innocent of all charges, and it is time for compensation: the return of Karelia and the indemnity unjustly levied on the people. Putin's position. 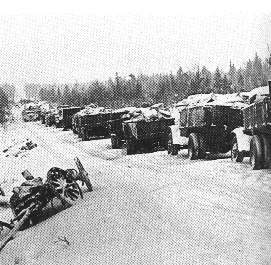 An estimated one million Soviets were wounded or died on Finnish soil while attacking Finland in the winter of 1939-40. Western sources often grossly underestimate Soviet losses. These were the result of Soviet propaganda when they wanted to minimize their reported losses. Later, of course when they wanted sympathy, they increased their numbers. The writer does not attempt to give a complete picture from The Winter War to armistice. Instead, these pages fill in information gaps left out for various reasons by others. Sometimes the information exists only in archives, old photos, or it is not considered politically correct enough to print. There are some sensitive Russian photos which were found left behind by the advancing Finnish army in 1941. You will find them and the first-hand account of one phase of the Continuation War around Lake Laatokka (Ladoga) as documented in the family photo album. You can find "official" historical accounts in sites such as this one by Stephen Payne who maintains that both Finland and the Soviets failed to understand the other's concerns, which ended in the tragedy of war. Stalin and Hitler started the Second World War when they attacked and occupied Poland. On August 23, 1939, Stalin and Hitler divided eastern Europe amongst themselves in a secret pact. Finland was placed in the Soviet "sphere of influence" along with Estonia, Latvia and Lithuania. The pact was followed by Hitler's invasion of Poland. Stalin's Red Army came to the "aid of Poland" and invaded Poland from the East on September 17, 1939. Historians conveniently leave out Soviet invasions in Europe, especially that of Poland and the Baltic States. History Channel's "WWII The Lost Color Archives" shows Hitler attacking and occupying Poland, but does not mention Stalin's occupation of the Eastern half. While this oversight may be innocent enough, it is serious. The three small Baltic countries were then occupied/invaded by the Soviets as per the agreement and later encorporated into the USSR by "unanimous" elections. Finland was next. Stalin offered Finland a cake: the icing was the "legitimate" concerns of U.S.S.R., while underneath was a rotten core consisting of the real motives: annexation. Finland had a choice: give up ground (Karelia) and then be attacked, or stand up against the aggressor. From a tactical point of view there really was no choice. Finland had no desire to be anyone's occupied buffer zone. After the Soviets had begun military operations with Hitler, they requested minor adjustments to the border on the Karelian Isthmus and the lease of the Hanko peninsula at the mouth of the Gulf of Finland in return for a slice of East Karelia. No international law states that a country should give land to another country for defensive reasons, and Finland was within its rights to refuse. Paasikivi and Tanner, Finland's negotiators, felt that the territories requested were of military importance and refused Stalin's proposal. They didn't trust Stalin, nor did they accept at face value, Soviet concerns that a foreign power might attack Russia across Finland. I would think that a foreign power would use just such a tactic if it wanted to annex a neighboring country. Appeal to defence requirements, request the placement of "limited" forces on their soil and follow through with the rest of it when you have the advantage. If you look at a map, an attacking fleet would be wiped out in the Baltic as they sailed first past the Baltic countries, then into the Gulf of Finland, which was easily mined by both Russia and Finland, if they just cooperated. All Stalin had to do was ask Finland to mine their half of the Gulf of Finland, and do a few other things. There was no need to demand Finland compromise their defences, giving its strategic military advantage over to the whims of a foreign power. Finland is not easily crossed from either the west or the east, unless you cross in winter, not an easy matter either. A mechanized German army would have just as much trouble in Finland as the Russians. The Finns were in their element, like the rabbit in the briar patch. The writer, like the Finnish leadership of 1939 believes that Stalin was just using it as an excuse, a believable one at that. But the Finns traditionally mistrust Russians, so it was no surprise that they mistrusted this murderer, Stalin. There is absolutely no way that Stalin could be considered a normal human being - he was a pathological, but clever, genocidal criminal, back-stabbing friend of Churchill and Roosevelt, who was never punished. This is the man many of the other writers want to believe at face value. Stalin wanted to make a deal the Finns could not refuse: "say Finnsky, how about you all giving us Karelia, and we will more than compensate you with some wasteland up north." (not an exact quote but the spirit is there) The Finns have an uncanny ability to see through Russian demands; it comes with the territory. On November 30, 1939 the Soviet Army attacked Finland on all fronts with army, air force and navy; Helsinki was bombed, and 91 persons were killed. On Dec. 1, 1939, a puppet government headed by Finn-hater and Stalin's ghost writer/purge-accuser, Otto Kuusinen, was installed by Stalin in Terijoki. When the Soviet Union invaded Finland, Antti, the writer's father, was in one of nine divisions of Finns against an army of 600,000 men divided into four main army groups over a 1000 km front. The odds pitted against Finland were so overwhelming that observers abroad expected the Finnish resistance to collapse in a short time because Finland was not well equipped to wage war with Russia in 1939. But the Finnish Army was well trained and they improvised and captured enemy weapons. Unlike the Norwegian army which required 84 days military service, every Finn had to serve a full 365 days. They would need every bit of that training. By the end of December, 400,000 Russians were dead, wounded, captured or trapped. After many defeats, Stalin was desperate for a victory, so he installed new leaders, changed his tactics, and sent in 1.2 million men with masses of artillery. Finally in March, after Stalin's Red Army, that was coming to "liberate" Finland, had become an embarrassment to Soviet Union, the Finns began secret negotiations for peace. How the Russians suffered in the Winter War. Russians discuss what went wrong. Molotov's denial that USSR is bombing civilians. The case against the "Finnish Threat to Leningrad." Nikita Sergeyevich Khrushchev, a native Ukranian, remembers very well. "I had firsthand knowledge of what happened, including the strategic miscalculation on our side. The very day the war with Finland started, I was in Moscow with Stalin. He didn't even feel the need to call a meeting. He was sure all we had to do was fire a few artillery rounds and the Finns would capitulate. Instead, they rejected our terms and resisted. There was a false sense of confidence on our side; a few days would pass and we would polish off the Finns. But that didn't happen either. Many of our troops were ground up by the Finns...Stalin lost his nerve after the defeat of our troops in the war against Finland. He probably lost whatever confidence he had that our army could cope with Hitler. Stalin never said so, but I came to this conclusion watching his behavior." "We soon realized that we had bitten off more than we could chew. We found ourselves faced with good steel reinforced fortifications and effectively deployed artillery. The Mannerheim line was impregnable. Our casualties mounted alarmingly. In the winter it was decided to bypass the Karelian Isthmus and to strike a blow from Lake Ladoga to the north where there were no fortifications. But when we tried to strike from the rear, we found ourselves in an even more difficult situation than before. The Finns, who are a people of the North and very athletic, can ski almost before they can walk. Our army encountered very mobile ski troops armed with automatic high velocity rifles. We tried to put our own troops on skiis too, but it wasn't easy for ordinary, untrained Red Army soldiers to fight on skiis. We started intensively to recruit professional sportsmen. There weren't many around. We had to bring them from Moscow and the Ukraine as well as from Leningrad. We gave them a splendid send-off. Everyone was confident that our sportsmen would return victorious, and they left in high spirits. Poor fellows, they were ripped to shreds. I don't know how many came back alive...And so the war with Finland ended. We started to analyze the reasons why we were so badly prepared and why the war had cost us so dearly. I'd say we lost as many as a million lives...There's some question about whether we had any legal or moral right for our actions against Finland. Of course we didn't have legal right. As far as morality was concerned, our desire to protect ourselves was ample justification in our own eyes." Stalin thought the problem was that his soldiers were poorly motivated, so he had political commissars there to encourage them and to follow them into battle. If they advanced against the Finns, then the Finns shot them down. If they retreated to the rear then the NKVD officers shot them down. They were also told that if they were taken prisoner their families would be arrested. And they themselves would be sent to Siberia or killed upon returning to their homeland. "But the Finnish government, prodded by Western powers, rejected these proposals and broke off the talks on November 7, 1939. Helsinki apparently believed that taking a "firm line" toward the Soviet Union, with the support of Britain and the U.S., was in its best interests. Finland carried out mobilization amid frenzied militarist propaganda, concentrated its troops on the border with the U.S.S.R. and provoked one border incident after another. Armed provocation continued despite warnings from the Soviet side, and on November 30, 1939, hostilities began between Finland and the Soviet Union." Headlines in the Communist Party newspaper the "Daily Worker" announced on December 1, 1939 "Red Army Hurls Back Invading Finnish Troops." Russian attackers (liberators) Bogged Down. Rush hour on the Finnish front. Antti is out there somewhere. with a Molotov Cocktail, "throw it into the engine air intake." Terijoki was the "Finnish Riviera" on the Gulf of Finland. With Kilometers of beautiful sand beaches, it was a favorite holiday spot for city folk who lived in Viipuri (Vyborg), the second largest and most cosmopolitan city in Finland. Meeri Saarnio (writer's mother) spent summers there on the Gulf of Finland with her family. During the summer of 1938, powerful spotlights were directed at the Finnish shoreline. They were military maneuvers out of Kronstadt - preparing, foreshadowing, the following year's campaign. Viktor, (Vihtori) Meeri's father cautioned against looking directly at the intense light, which disturbed the peaceful Finnish life. The Russians were already planning their move into Finland, and Stalin had been busy preparing East Karelia between 1937-38 by shooting Karelians and Finns by the thousands. Click Map. For Antti, life in the Finnish province of Karelia during the 1930's was nice. It was a good place to live and Viipuri was a fun place to be at the age of 19. He met Meeri in the summer of 1939. Because of the free system and hard-working people, it was prosperous, a place where Antti and Meeri wanted to settle down and make a home. But things were about to change drastically, for Stalin and Hitler had other plans. According to a Polish friend of R.Pratt (Antti's friend) Stalin was worse than Hitler. When asked how he knew since the Poles fought the Germans, not the Russians, he said, "I know, I was in a Soviet prison camp." You see, while the Germans attacked from the west, the Russians attacked from the east. Many Poles thought they had come to help, but this was not so. The Soviets marched off 300,000 polish troops to prison camps while the world focused its fury on Germany. Sometimes historians "forget" to mention that Stalin too started WWII by attacking Poland. Stalin was also responsible for the Katyn Massacre, he said. ( more than 14,500 Polish officers murdered) Between Lenin and Stalin, over 40 million people were massacred in Stalin's holocaust, and many of them probably by bullets supplied by England and the USA. The actual number may be close to 70 million. Russia today continues to practise genocide, especially in Chechnya. They have told the world that they are only killing terrorists, but this is a lie. In January 2005 Putin announced that he is restricting journalists to those who show "respect" to Russia, meaning you better not say anything bad. You can't say Russia is a nest of thieves, or controlled by Mafia. No, you must say they are nice, come invest your money here, it is safe. (We won't nationalize our businesses, honest.) Tell me, who can trust the Russians, and KGB Putin in particular? Putin recently said once a KGB always a KGB. I think that speaks volumes. They are paranoid for a good reason, i.e. all the land they own used to belong to someone else. Finns know it, and this is why Finland is free today. During the Winter War the Finns lost 25,000 people by fighting the Soviet Union. If they had given in to the Soviet demands, like the three other Baltic States, the chances are that they would have had over 400,000 people killed. It seems that they made the right decision, and at the same time saved the N K V D officers a lot of work. The Winter war was followed by peace, but on June 22, 1941 Soviet Union resumed hostilities with Finland. Because the Soviets broke the peace, the Finns called it the Continuation War. Thank you for visiting, please come again.